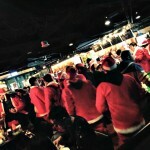 Day 555 In Beijing: SANTA CON!!!! 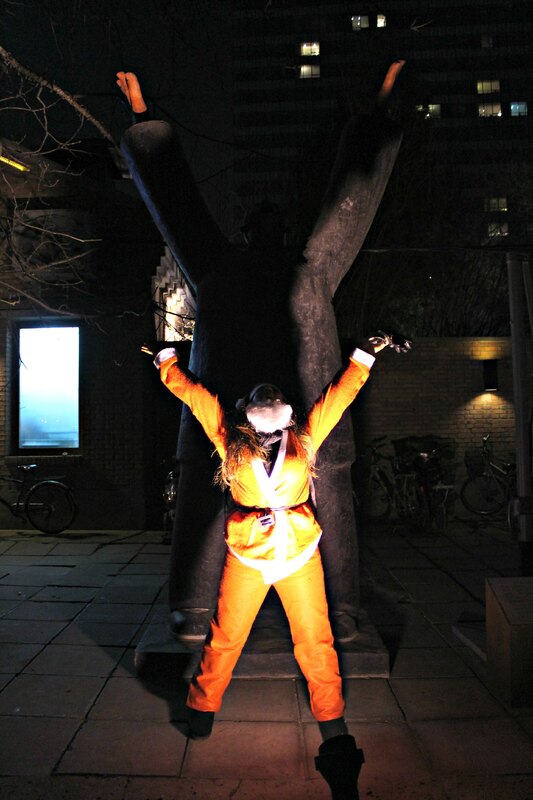 Me in front of one of my favorite sculptures. 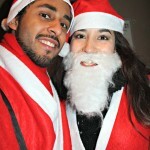 Jill and I did Santa Con last year in Beijing and had a blast. We met a lot of people and made some amazing friends during it. 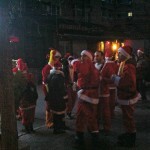 I also did Santa Con the year before I came to China, in San Francisco, and something like 5000-10000 people showed up. Beijing rolls about 150-200 people deep but it is almost more fun because Santa Claus and Christmas is still a novelty here and people are really surprised and seem to enjoy a bunch of crazy laowai walking around and giving out candy and having fun on the streets. 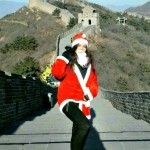 Our friend, Federica, who is from a small town near Turin, Italy, wasn’t able to come out with us this year but posted a picture of herself wearing a santa costume on the Great Wall of China. 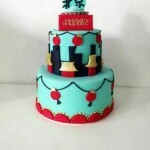 I can only imagine what the Chinese nationals out there thought about it. They probably laughed and loved it. I know I would have. Federica is hilarious and one of our closest buddies. She’s also in the first picture above this post. We hung out with our friends Barbara and Patrick most of the time. 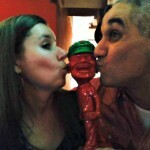 Barbara is from Brazil and Patrick is from Cape Verde. They met here and have fallen in love and are a super cute couple. We love hanging out with them because they have such positive attitudes and also want to travel the world and see what is out there. 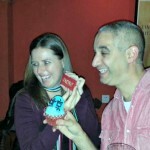 Barbara is also an awesome salsa dancer and Patrick is great at dancing kizomba and merengue. We also hung out with our friend Rachel, who is in the picture below with Jill, who flew up from Hong Kong just to hang out with us this weekend. We call Rachel, “Our daughter” because she is 26 and we feel like she is our kid. 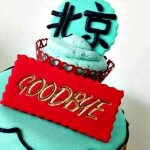 She’s actually third generation Beijing-ren (ren means person) and moved to Hong Kong for work about 3 months ago. 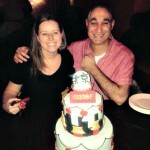 We met at a Jing A beer and food pairing at The Big Smoke a while back and became fast friends immediately. 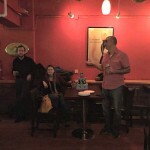 We hit about 6 different bars and ended up at our favorites, The Local and Jing A Taproom. On our way, we stopped by The Big Smoke and passed by Beijing Sideways, which is a tour company where you can rent motorcycles, with sidecars attached, and do tours of Beijing, China and who knows where else. Someone hired them to ride all the way from Beijing to Paris, if memory serves correctly. 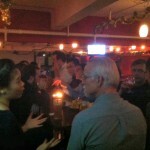 One of my friends, Moeava, used to work there and is setting up the same company in Tokyo. That is the part of Beijing that Jill and I truly love: Meeting so many people, from all over, that have such different attitudes and ideas on how to live life. We enjoy being excited by their new ideas, their willingness to take a chance and their desire to try something new. The Jing A guys, Kris and Alex, are perfect examples of this: Kris Li worked at Cisco and Alex Acker worked at Ogilvy and Apple. 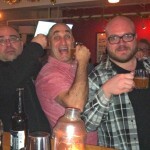 About 3 years ago, they started home brewing out of one of their bathrooms. Then they built up and became more popular. The owner of The Big Smoke, Kris Ryan, asked if they wanted to build their brewery in his restaurant and they agreed. Just about 4 months ago, Kris Li and Alex started their own restaurant, the Jing A Taproom, and it has been a huge success. It has been wonderful to watch them learn, grow and strive to be their own people and not just stay stuck in an “easy” career or life. Alex also got married to the amazing Ashley while we were here and we’ve been able to celebrate their new life together as we’ve seen it grow. 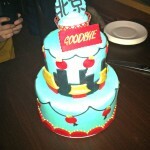 We’ve made so many friends, in just 1.5 years, it is hard to believe. However, that is why we love traveling and being out there: There are always adventures to be had and places to see. We’ve seen so many of our friends make these amazing choices and live lives of adventure. I wonder what adventure is next for us? Jill and me at The Great Leap Brewing Taproom. Rachel and Jill by the Beijing Sideways sidecars. 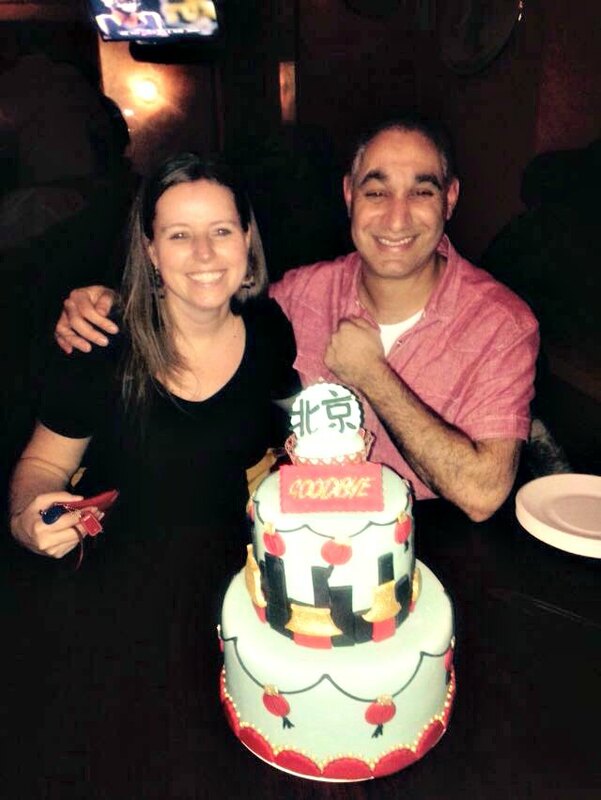 Jill and me at the Beijing Sideways sidecars. A national walks right thought the photograph. I should just do a post on how often this happens. It is absurd. Yes, Santa is wearing a chicken costume this year, kiddies. 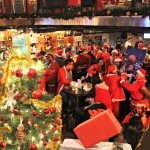 Another shot of Santa Con at The Local. 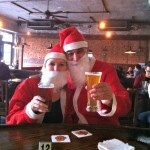 Lots of Santas in The Local. 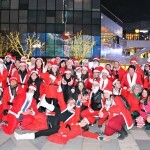 The whole Beijing Santa Con crowd. Barbara and Patrick. Patrick took a few of the pictures here also. 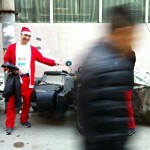 Federica brings Santa Con to the Great Wall! 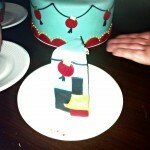 Day 554 In Beijing: NAZARS or Protection from the Evil Eye! Jill and I grew up with very different stories told to us as children. Her parents weren’t world travelers and she must have gotten that from somewhere inside herself. I, on the other hand, grew up with stories of traveling everywhere, whenever possible, however possible, and whyever possible (a new word I just made up). My grandparents once bought a Volvo station wagon, in Sweden, and then drove all the way down to India. If I remember this correctly, this was in 1960s or 1970s. Incidentally, I took my driver’s license test in that wagon and passed it on the first try. It was a boxy, blue 240. A classic. I, therefore, remember stories my grandparents would tell me about driving through Turkey, in their volvo station wagon, and ending up parked, on the side of some mountain, with a bunch of Turkish truck drivers, and dancing all night long. I was raised to believe that traveling was the norm, not the exception, and that staying at home was somehow a strange choice for our family. Because of these trips, my grandparents always had interesting artifacts around their house: Indian sculptures and statues of gods, photographs and paintings from all over the world, and jewelry from their travels. My grandmother had a lot of jewelry with Nazars on them. 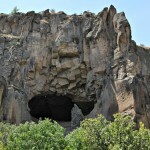 This was, according to Turkish myth, to ward of the Evil Eye and protect people. So, when I saw this tree, with all these amazing Nazars on it, I immediately thought of her and took a picture. I thought we had taken pictures with us sitting in the chair but I guess we did not. 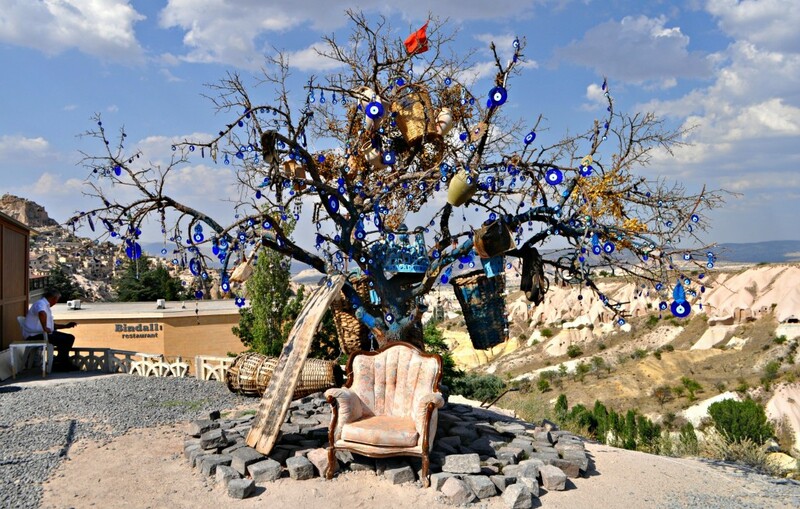 That just means we have to go back and visit this amazing tree sometime in the future! I think my grandma and grandpa would approve. 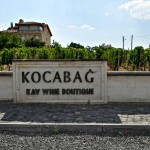 Day 553 In Beijing: Kocabag Winery in Cappadocia. Jill and me enjoying the wine. 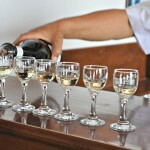 After seeing the Agzikarahan Caravanserai, Jill, our crew and I all went to do a little wine tasting. 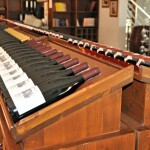 Jill is a big time wine lover and so am I so we thought this would be fantastic. 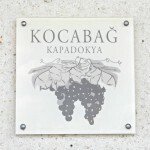 We’d been quite impressed with the wines from Turkey, so far, and were looking forward to checking out Kocabag Winery. 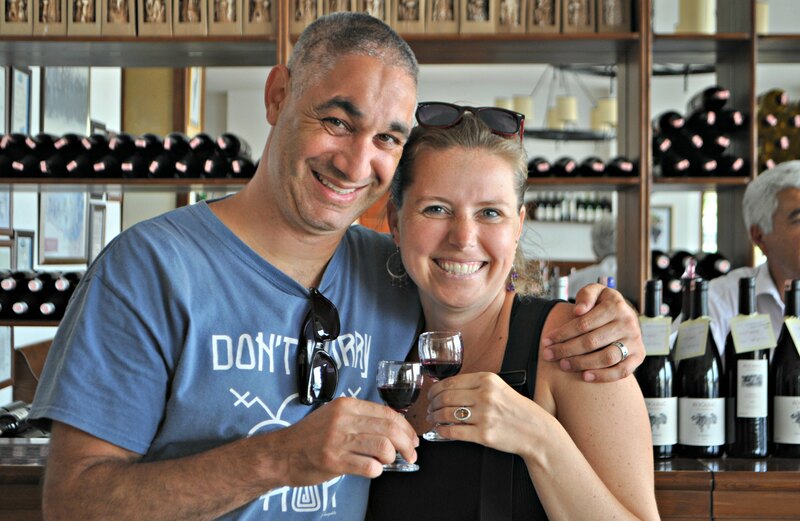 They are rated as one of the Top 5 wineries in Turkey and we had tried a few bottles of their wine in the previous week or two.It was very beautiful and the wine was excellent. Sadly, because of the government and the Muslim influence, alcohol is very highly taxed in Turkey so an average bottle of wine costs around $15 USD. This isn’t really nice wine so the type of wine that Jill and I like to drink is up there in price. Therefore, we did some tasting but didn’t buy any of the wine at the winery because we continue to be on a budget and need to stay frugal no matter how much we want to party and have fun. 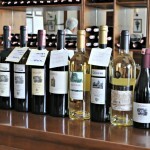 FYI, winery tasting rooms usually charge more for wine so we usually buy them in the stores. Again, it isn’t as romantic but it is frugal and we can afford to travel more often if we do that. However, Andrea bought some and it came in a beautiful bag. 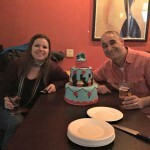 We took our time, walking around the tasting room, and talking to the attendants. There are a lot of different varietals, most of which we had never heard of, and it was nice to try new grapes and new wines to help us learn more about the world and open our palates to new experiences. That is what traveling is about for Jill and me. As we drove up to the winery. Their line up of wines. 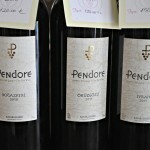 Some varietals we’d never heard of before tasted very yummy! 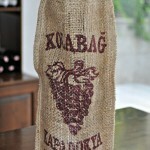 A beautiful bag for the wine. 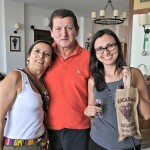 Andrea and her parents with their wine. 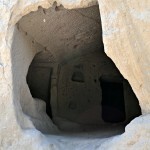 Day 552 In Beijing: Agzikarahan Caravanserai In Cappadocia. A bird flying through the skylight. Jill, our crew, and I hopped back in our little 10 person van and took off down the road. Driving out of the Ihlara Valley was a nice way to end the trek and just look back on everything we had seen from the valley floor. 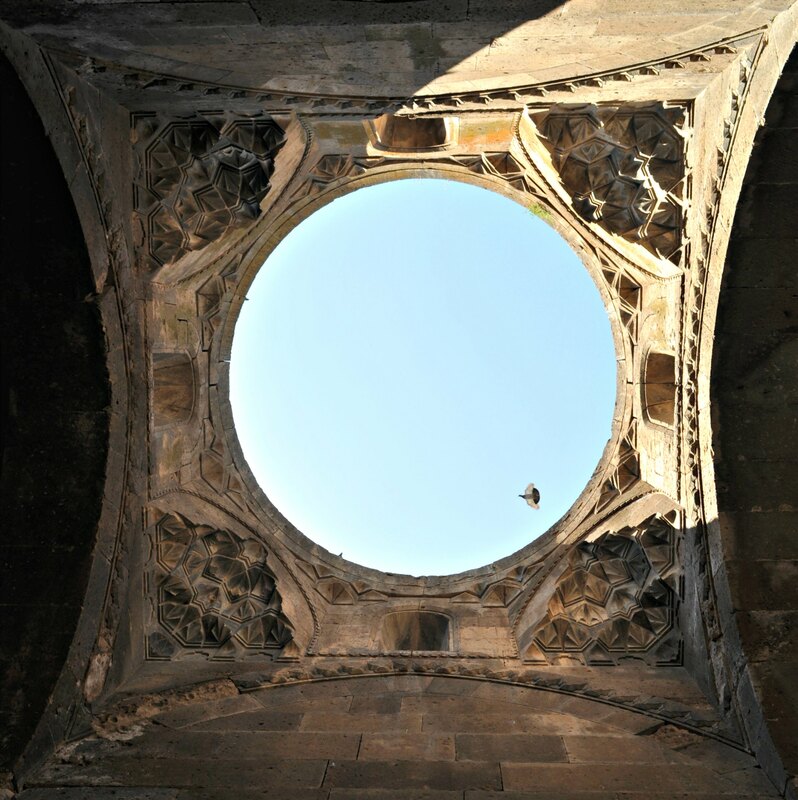 We were told we were going to see the Agzikarahan Caravanserai next and I was very excited to see this location. 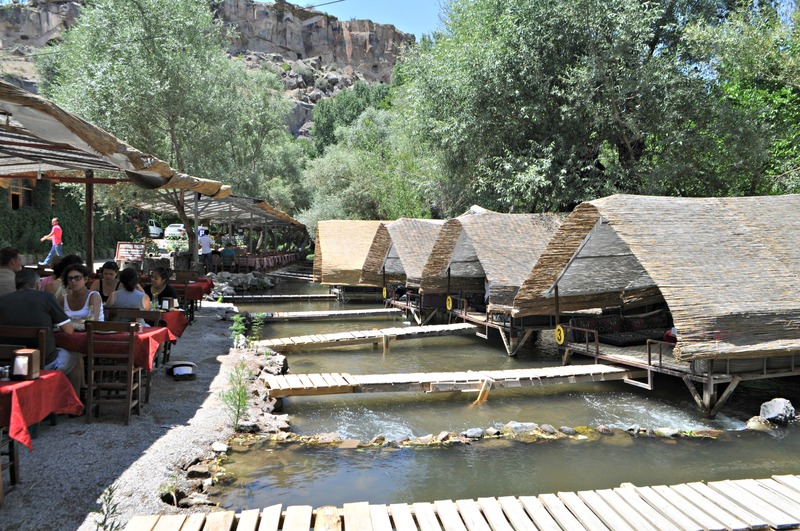 Agzikarahan is one of many different stops, for the travelers, and their camels, as they crossed Turkey back in the past. 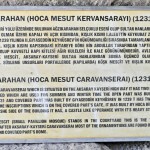 “Agzikarahan” means “Black Mouth” in Turkish and caravanserai means, pretty obviously, “Caravan.” Agzikarahan is the name of the town where this caravanseri was built. This was part of the famous “Silk Road” that stretches all the way back through China. 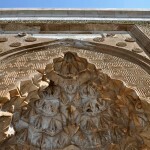 The Agzikarahan caravanserai is amazing. 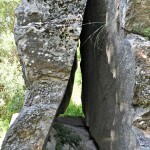 The walls are incredibly thick, to resist any attack and it is totally imposing to outsiders. It is actually quite imposing to people inside also as we found out when we went inside. 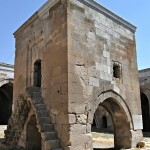 There are many of these caravanseris in Turkey because the traders would use them, as stops, every 30-40 kilometers as they made their way to and from their destinations. Why every 30-40 kilometers? Because that is about as far as a camel could go in one day. Pretty ingenious if you ask me. Most of them were built in the 13th Century and many are being refurbished as they are becoming more of a tourist attraction. 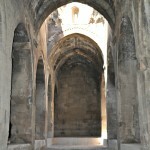 Inside of the Agzikarahan caravanserai was a small church. 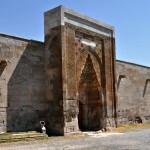 It later was turned into a mosque, as the Muslims took over Turkey, and is still in very good condition. We walked around and checked out the no longer used stable and were amazed at the architecture and how they made us of “sunlights” in the ceilings so that rain water, and sun light, could get inside if they needed it. I love how decorative and beautiful this caravanserai is and would enjoy seeing more of them and doing a trek back to China at some point. I probably will use a train or car instead of a camel. Imagine that trip? 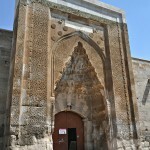 The sign as we enter the Agzikarahan Caravanserai. 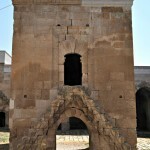 The entrance to the Agzikarahan Caravanserai. 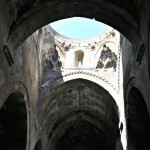 As we come closer to the entrance of the Agzikarahan Caravanserai. 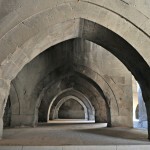 The mosque inside the Agzikarahan Caravanserai. Inside the mosque. I would guess that these were Christian Saints. 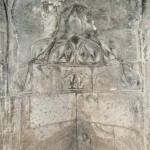 The ceiling of the mosque. 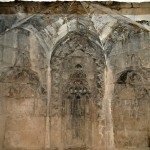 One of the corner pieces of the mosque. Another view of the mosque. An opening in the stables. 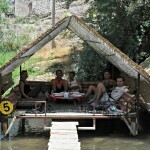 Day 551 In Beijing: Lunch at Belisirma Village, Ihlara Valley: Video. 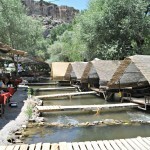 To really get the feeling of being at Belisirma Village, in the Ihlara Valley, Jill and I think a video is necessary. So, without further ado, here is a video! 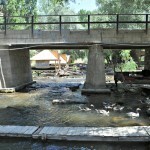 Day 550 In Beijing: Lunch at Belisirma Village, Ihlara Valley. 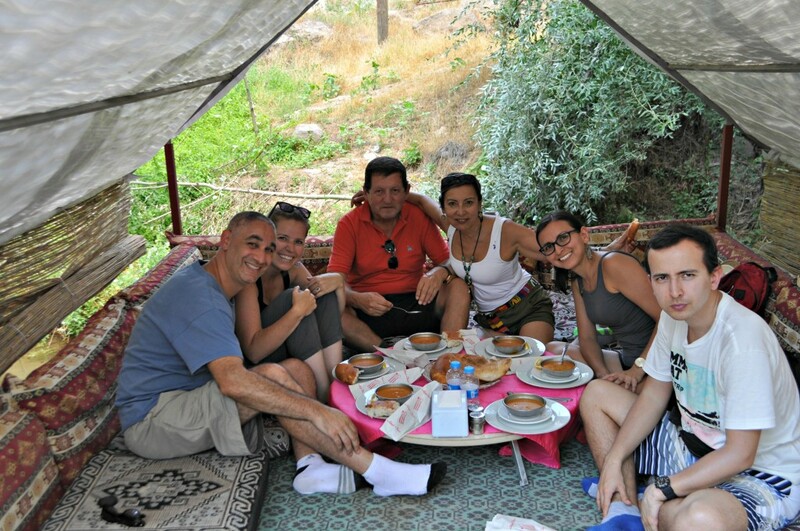 Jill, our group, and I were ready for a nice lunch when we arrived at Belisirma Vilage in the Ihlara Valley. As we got close to it, we heard people talking and saw a bunch of geese in the cool river. We had no idea what to expect but we noticed the cute little water gazbebos all along the river and hoped we would be able to sit in one. We were guided to one and crossed the little bridge and took our seats. The waiter came over, took our orders and gave us some drinks to cool our bodies. It all tasted great and it was wonderful to sit above the water and just hear the sounds of peace and tranquility. There was also a very cute puppy that came around and wanted to hang out with us. However, he was afraid of crossing the little bridge so he just sat beside it and wagged his tail, looked at us, and then scampered off to eat food that others fed him from the tables on the other side. Our guide left to sit with the other guides and talk to friends, while we ate, and we and our friends from Colombia had a nice conversation about life. All in all, a wonderful way to end our tour of the Ihlara Valley. 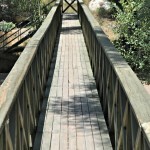 Going across the little bridge to our tent. The view up the river. 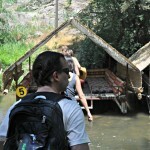 Day 549 In Beijing: Trekking Through the Ihlara Valley, Part 2. 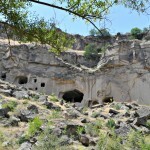 A large cave with cliff wall dwellings. Jill and the rest of us kept trekking through the valley. 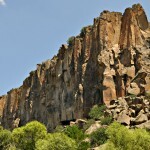 We also kept being amazed by the power of nature and how it could split rocks and make cliffs that look impenetrable. 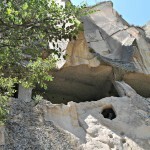 Incredibly, the cliffs weren’t as many people had built homes into them and lived there as you know. These were somewhat different as they seemed to be much smaller and more concentrated than the other ones we’ve seen. There was also a very big ant that was carrying around some food and was not going to be stopped by any humans getting in its way. I was continually reminded how small we humans are while also noticing how much we can affect our surroundings for thousands of years. It allows me to have perspective on my place in this world and this universe. Both in terms of how unimportant I am and how important I am. It is something I teach to my clients: Every single choice you make means everything…or nothing. It is up to you to decide how you want to be thought of, remembered, or forgotten. Because, sooner or later, we will all be forgotten and we will all be forgiven. Sooner or later, there will be no one to remember us so live the life you want to live, try to do the best you can, and remember to forget. Life really can be that simple. It, like everything else you do, is a choice. 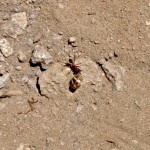 A very BIG ant with its food. 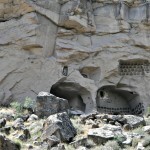 Some of the homes built into the cliff walls. 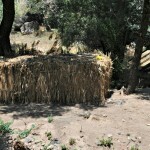 This reminded me of a piece of art that might be created by Andy Goldsworthy. 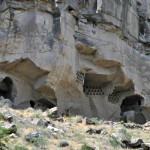 A close up of the cliff wall dwellings. 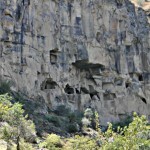 Even more cliff wall dwellings. 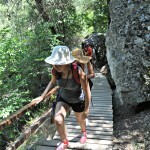 Day 548 In Beijing: Trekking Through the Ihlara Valley. Camilo Alejandro, Andrea, their parents, Jill and me. Jill and I were definitely feeling the heat as we entered the valley. Luckily, there was a wonderful little stream running through the middle of it and enough trees to cool us down. We had prepared and had on light clothing and a minimum of gear. At this point, we were only really carrying our camera, my iPhone (to use as a camera) and a few other things. We tend not to buy stuff so we don’t need to carry much or have a lot of extra gear to carry around when we go traveling the world. It really does make life easier as our choices are limited to what we really need compared to what we want. 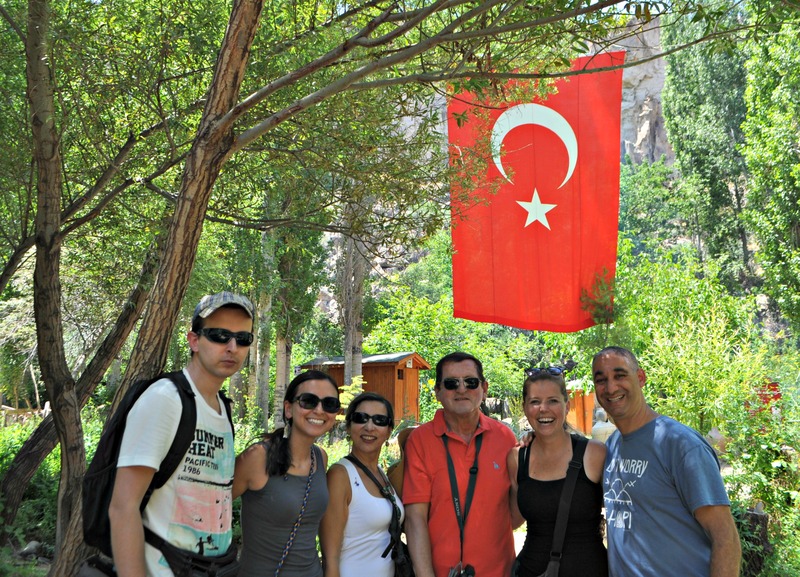 As we trekked through the valley, our guide Sibel told us stories of the people that used to live there and what they went through on a day to day basis. We also talked to our new friends from Colombia about where they had been, where they are going, and what they have enjoyed so far. 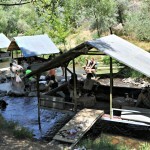 We were able to expand our knowledge by being friendly, open, and good tourists. Jill and I try to be good tourists as much as possible. People from the USA have received a pretty harsh label as bad tourists and we do our best to make up for it. We tend to tip well, really pay attention to the guides and what other people are saying, and find ways to connecting and showing that we care about the culture we are a part of at that moment. We also just enjoyed the peace and quiet of being in this gorgeous valley and having nature underfoot, and all around us, after being in Beijing for the past year. I once was told, when I was young, that if I ever feel down, I could go hug a tree. This person was a psychic, and I don’t believe psychics actually have any ability to tell the future or anything like that, but she was a Marin hippie also and probably realized that being in Nature is more important than most of us think. And, as crazy as it sounds, hugging a tree is incredibly calming and relaxing. It is sort of like meditation. So, being in nature like this, after being in Beijing, really made a difference in both Jill’s and my attitude and appreciation of life. Sibel and Jill walking up the stairs. Sibel did a great job as our guide! Andrea and her family climbing up the stairs. 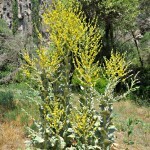 Just one of the many beautiful plants in Ilhara Valley. Imagine living in this cave? It looks like a monster! One of the bridges we crossed. 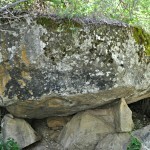 No monsters were hidden underneath it. 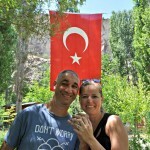 Standing under the Turkish flay with our rings and hands together. 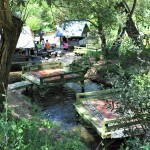 A rest stop with rugs and decks above the cool water. The tents above the water looked so relaxing. Day 547 In Beijing: Daniel Pantonassa Church in the Ihlara Valley. 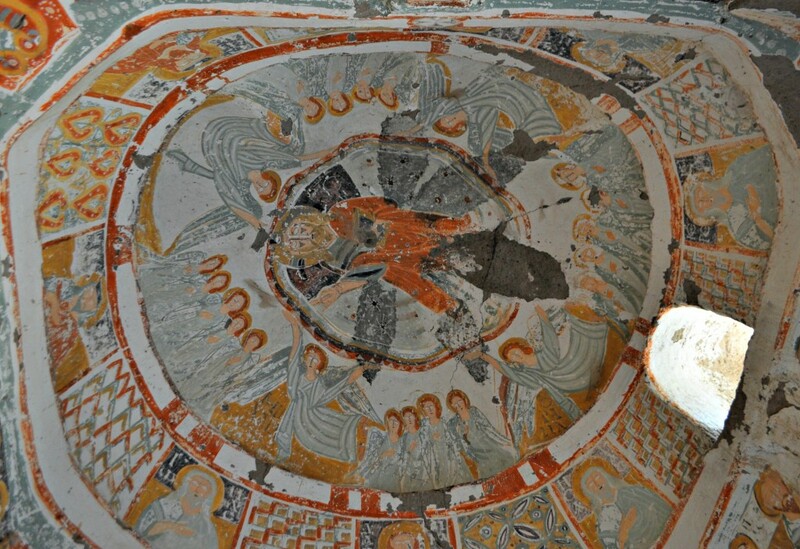 The dome above the main area in the church. After Jill and I descended the stairs, Sibel showed us the Daniel Pantonassa Church at starting of the valley. 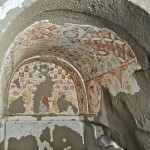 It was cut into the side of the mountain and the frescoes on the walls were amazing. 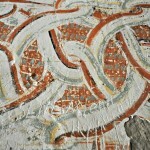 Many had been partially destroyed, either by time or by vandalism, but they were still very beautiful and worth seeing. As we traveled, we noticed that the faces, and eyes, of the figures in many of the faces in the frescoes that we’d seen had been destroyed. We asked about that and the reason is that in the Muslim religion, idols are illegal and so when the Muslims took over these areas, they specifically destroyed the eyes or faces as per their customs. Luckily, some went unnoticed and still survive while others have been retouched so that the original portraits are now visible. 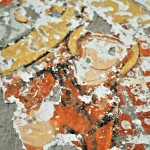 Many others will never be fixed because no one knows whose face was destroyed and only the rest of the figure remains. The Daniel Pantonassa Church was very small, and could only hold about 10-15 people at one time, but that would have been more than enough when it was originally built in the 10th Century. 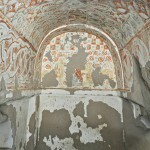 Think about that: These frescoes have lasted over 1,000 years in this desolate climate and region. It is absolutely amazing to think of how improbable that is even with today’s paints and knowledge of science to keep artifacts safe. 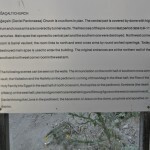 Information on the Daniel Pantonassa Church. A living space located above the church. Notice the handholds to climb up below the window. The entrance to the Daniel Pantonassa Church. 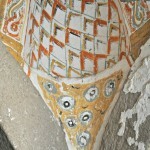 One of the four arms that creates a crucifix style church. Close up with painted over graffiti. 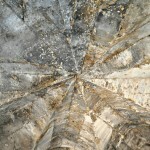 A close up of a figure whose eyes have been destroyed. Another view of one of the “arms” of the church.